Bulb location » Fig. 163. Hold the rear light assembly still with one hand and unscrew the plastic nut » Fig. 162 - A with the other. Grip the tail lamp assembly and carefully remove it by pulling it back at an angle with loosening movements. Do not pull the grommet with the cables out of the bodywork. To refit the rear light assembly, first insert screw A into the opening in the bodywork » Fig. 162. Carefully press the tail light assembly into the bodywork so that the bolts B latch with the mounts in the body. Hold the rear light assembly still with one hand and attach and tighten the nuts » Fig. 162 - A with the other hand. 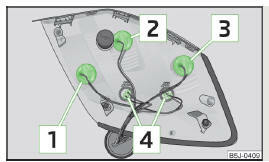 To replace the bulb, turn the bulb holder anti-clockwise to the stop and remove it from the housing » Fig. 163. Replace the bulb, insert the holder with the bulb into the housing and turn in a clockwise direction to the the stop. For slackening and tightening the plastic nut use a coin or similar object.